Vernacular Architecture in America. 23 April 1999. Most of us take our sidewalks for granted. In our youth, we are exceptionally aware of the sidewalk for its creative aspects (chalk drawings; melting surface for crayons) and for its evocative power ("Step on a crack, break your mother's back!"). As we age, we fear the sidewalk for its uneven pavement and potential to form dangerous patches of ice. Somewhere in the in-between years, we think only of our sidewalk when our kids draw embarrassing vignettes of our personal lives in 2 foot-high chalk scribbles, or when an an elderly passer-by finds the only 2 inch square patch of ice on our otherwise snow-free walking surface and sues the bejeezus out of us for fracturing the hip-replacement he just had installed a month prior. Sidewalks seem to be the epitome of mundane. Sure, there are pretty sidewalks, ugly sidewalks, dirt "sidewalks" and places without sidewalks... but for the most part, underfoot means out-of-mind. Mundane, as we have seen (Glassie, Upton), holds enormous potential to yield information beneficial to the understanding of everyday culture and society in the United States. With this in mind, sidewalks can be elevated into the pantheon of vernacular studies without the slightest smirk or furrowed brow. future by someone with a little more time and will-power than us. The most direct, easy-to-understand method of documenting our topic is to get out the and hit the streets, so to speak. A little walk around town will yield some basic information concerning type and style. Look around, and take in the various style aspects associated with the sidewalk. Look at the material and type of construction, location, and usage. Become familiar with the sidewalk and its components. Now step on that sidewalk and get to a library, court house, or records office and learn more about them. Sidewalk history may be somewhat difficult to pin down. For a municipality, records of when, where, and how sidewalks were installed should be a matter of public record. Beyond mere names and dates, the material of construction should be researched to better understand how it is used in the sidewalk. Type of material can be linked to local industry and / or to local contractors. 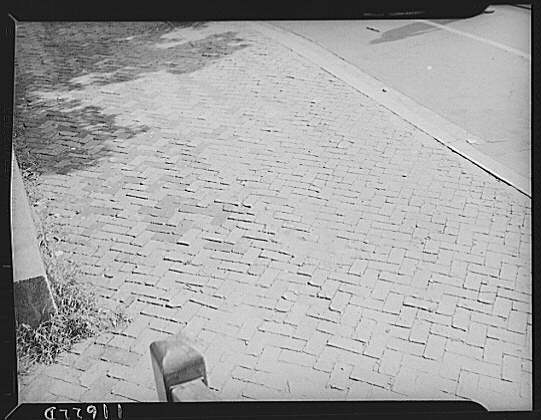 The more information that can be found, the better-- this will aid in establishing an historical context for the local implementation and use of sidewalks.For the local survey, this information should be enough to establish a chronology of sidewalk type and use, but it doesn't tell us much about Why and How the sidewalk is used by so many people. Knowing and understanding materials and dates are nice, but that information tells us little about how sidewalks can be used, or, more importantly, how they have been used. 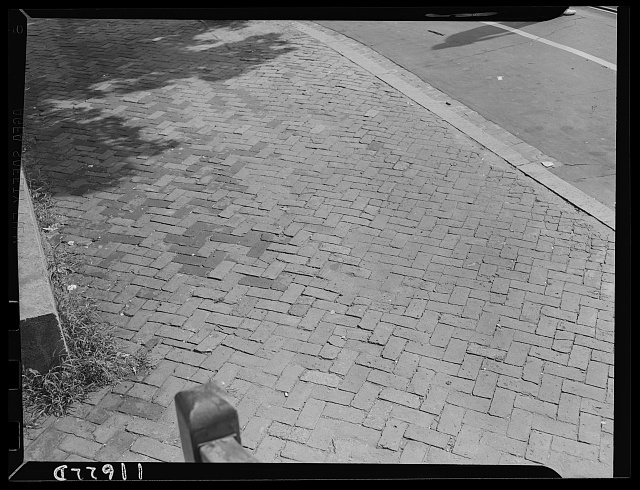 Next we must consider our subject within a social context: how have the needs of society altered or effected the sidewalks? Sidewalk placement is an obvious aspect that is socially controlled: obviously one is more likely to find sidewalks in a friendly shopping main street area than in a super collection of big box retail stores designed to be accessed only by the automobile. Therefore, the development of a town or city must be examined to discern patterns of use. 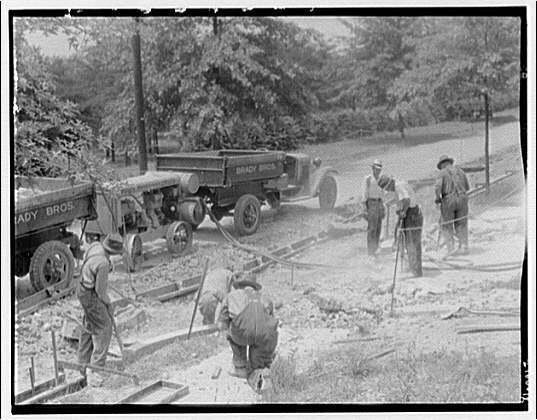 Were sidewalks installed before or after modern road surfaces? Are sidewalks wider in some parts of town than others? Are sidewalks missing from other parts of town? A number of questions must be asked to see how sidewalks fit and changed with the social needs of a town. Cultural aspects of a society can also be examined to learn more about the forms and values of the American sidewalk. As has been seen in other works (Read, Cromley), sidewalks are treated differently depending on the neighborhood. Sidewalks, while technically municipal property, have been utilized by some to exert a presence and show of domain in some 'hoods. Stylistic embellishment of sidewalks and related paraphenalia (planters, benches) often display a certain amount of attitude and feelings for one's home and neighborhood. These things must all be examined and dealt with in-depth in order to truly learn the implications of the sidewalk in history. We must be dedicated and persistent in our approach to this subject. The manufactured ground that we walk on is truly everywhere, and it seems that it would be easy to lose sight of the goal of the research: to learn as much about our culture and society through examining an underestimated part of everyday life: the sidewalk. 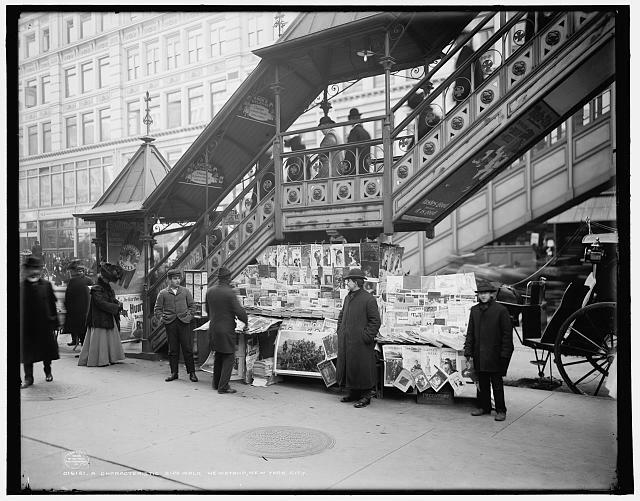 The sidewalk can be researched as a social indicator, a cultural prop, or merely as a utilitarian surface. As a society, our attitude toward sidewalks is exceptionally lackluster. Much can be learned by simply looking and identifying that which we choose to ignore everyday. "Sidewalk in Syracuse, Kansas. The level on the ground on either side of the sidewalk was the same as that of the concrete sidewalk a year ago. The raise in elevation is due to dust and dirt which drifted in." 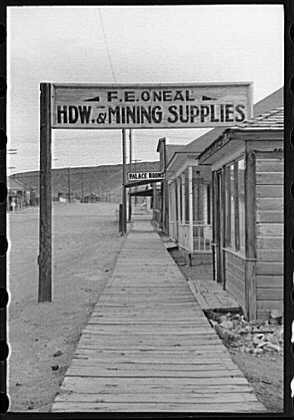 Aug. 1939. Lee, Russell, 1903- photographer. "Avenues and streets. 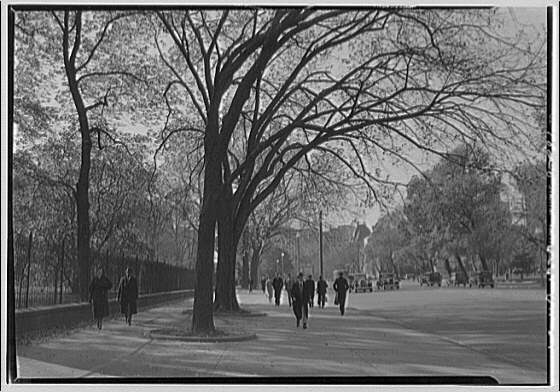 Sidewalk in front of White House." ca. 1920-ca. 1950. Horydczak, Theodor, ca. 1890-1971, photographer. 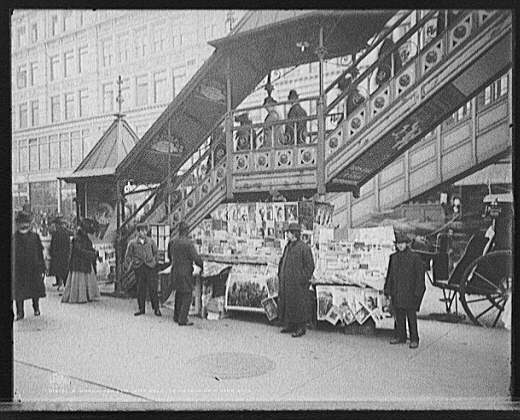 "A Characteristic sidewalk newsstand [sic], New York City." c1903. Detroit Publishing Co., copyright claimant, publisher. "Board Sidewalk. 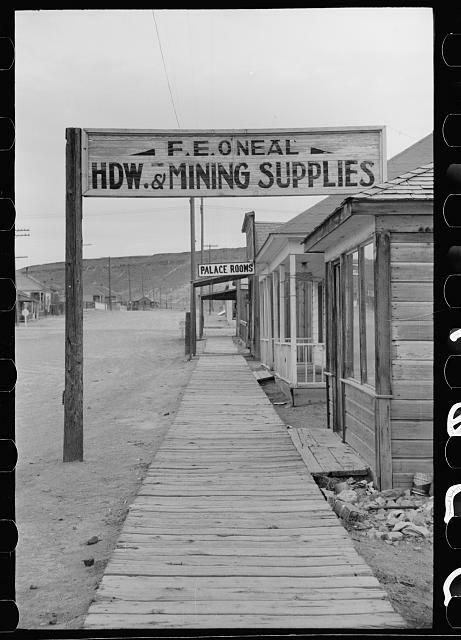 Goldfield, Nevada." Mar. 1940. Rothstein, Arthur, 1915- photographer. "Washington, D.C. Brick paving detail in Georgetown." 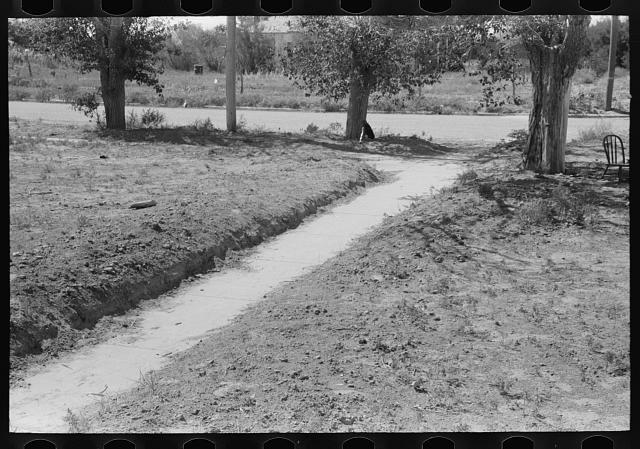 1942 Aug. Ferrell, John, photographer..
"Road construction site. Men making curbs I." ca. 1920-ca. 1950. Horydczak, Theodor, ca. 1890-1971, photographer. National Pavement Asphalt Association. "Frequently Asked Questions: Some Frequently Asked Questions About Asphalt; Some Key Points About Asphalt; Terms and Definitions." "Easy and informative, BrickPaving.com shows you the durability and beauty of interlocking pavers and the charm that they add to your driveway, sidewalk, street, patio or plaza." "Never shovel snow and ice again! Installs in minutes over your existing walkway or driveway. Just plug it in and watch your winter worries melt away." Yahoos categories for Concrete: http://dir.yahoo.com/Business_and_Economy/Companies/Construction/Concrete/Organizations/. Hollywood Walk of Fame. "Envisioned in 1958 as a lasting tribute to the personalities who helped make Hollywood the most famous community in the world, the walk continues today as a superior asset to the city, perpetuating the aura that has made the name Hollywood synonymous with glamour." How far can it go? This is what we perceive as sidewalks.